One of the most beautiful areas in Hungary is located between Tapolca and the north-western shore of Lake Balaton: hills, soft valleys often with cottonwoods, beautiful views – a place of relaxation and peace. St. Andrea as I already wrote once is one of the most interesting and definite best wineries in Hungary. It is located at the edge of Egerszalók which is a village in the heart of the Hungarian wine area Eger. The person behind of all is even a “doctor”. Dr. Lörincz György. Usually I do not believe too much in Hungarian white wines although there are of course some exceptions. Not really surprising that one of this exception is a wine of the vinery St. Andrea. The (success) story of St. Andrea is quite impressive: nowadays they husband nine vineyards and with 17 different sorts of vines. 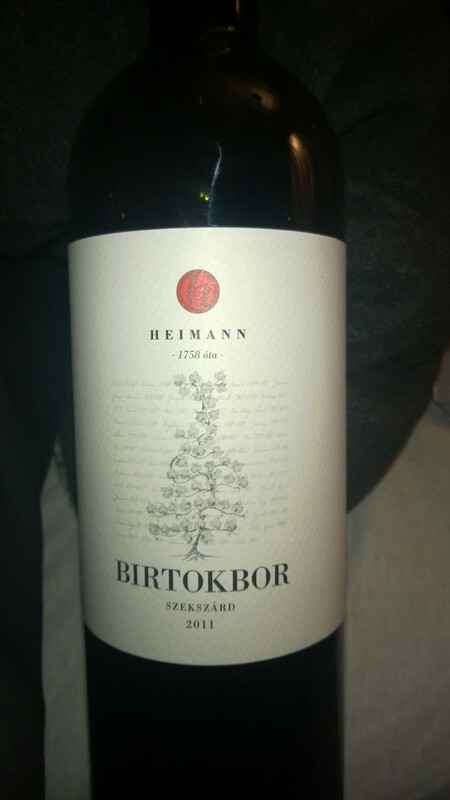 This is the big brother of Heimann’s Birtokbar which I introduced some while ago: https://avdwineandfood.wordpress.com/2015/03/12/heimann-birtokbor-szekszard-2011/. 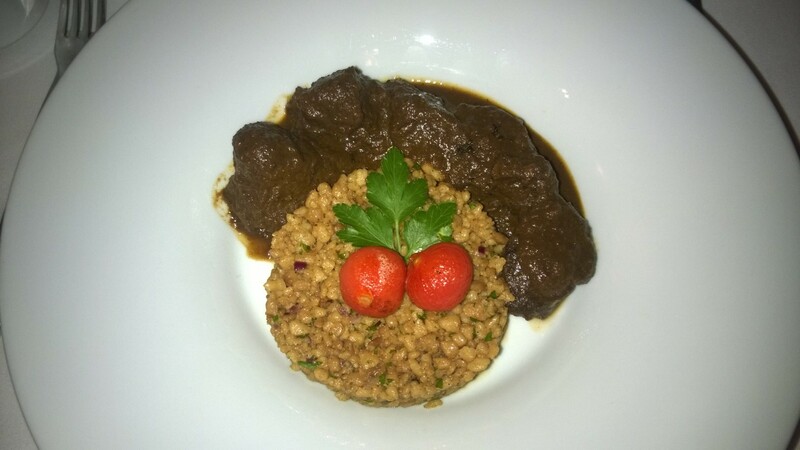 The wine comes from Szekszár which is in Southern West of Hungary. The area covers the Eastern foothills of Transdanubian hills. The soli is mostly loess but also a little bit stony. It is one of the warmest areas of vineries in Hungary as the summers can be really hot there and usually they have long warm autumns as well. I would believe that everyone who ever came in tough with sweet wine had once or even often a Tokaji, probably still the most well known and internationally exported wine from Hungary. Tokoji is without any doubt one of the most traditional and eldest wine sort, it is made out of only four sorts of grapes which aren’t well known at all: Furmint, Lindenblättriger (Lipovina or Harslevelü), Muscat and Zéta. The name of the wine comes from the Hungarian city Tokai. Although everyone thinks this wine is only Hungarian origin, there are Tokai wines also from Slovakia – mostly from those Slovakian areas revanchist of Hungarian establishments’ sometime calls Hungarian hemisphere. The area is the most northern foothill of Balkan mountains called Carpathians. There is volcanic and also clay soil but due to the geographic location is one of the coldest areas of Hungary. You wouldn’t consider that this is a typical and appropriate wine area. But it is, in particular for this kind of wine as it needs not only sun and heat but also wet and foggy autumns before the harvest as grapes need to mature long upon they are noble rot and small like rosin. My friend Gabor Kereszty brought me a box of six different wines from the Hungarian winery Heimann. Although I thought I would know more than others about Hungarian wine, I must admit I didn’t know of Heimann, from the southern city of Szekszard. Like all really good Hungarian wine, this is a cuvée! 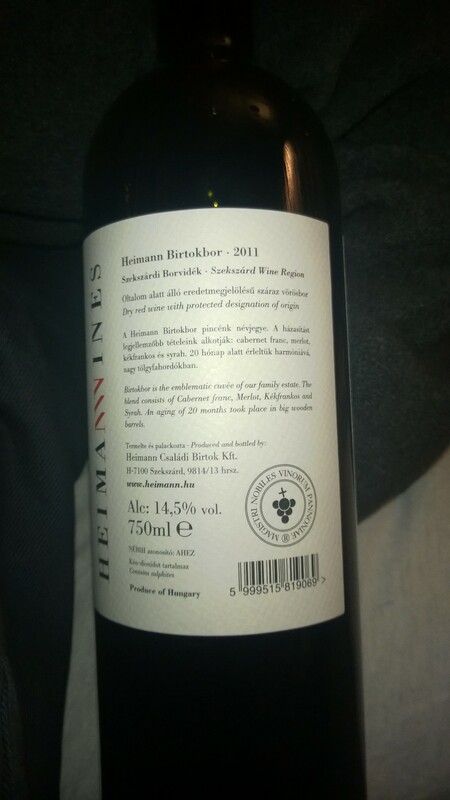 Birtokbor contains Cabernet Franc, Merlot, Kékfrankos (Blaufränkisch) and Syrah – according to the website of Heimann (http://www.heimann.hu/en/menu/wines). It is the very well-balanced combination of grapes that makes it very notable and, simply speaking, good.